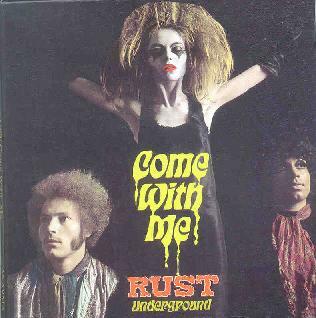 Rust - "Come With Me"
It seems there's a lot of bands these days trying to "re-create" some glorious sound of the 60's or 70's. Sometimes, they come quite close. But there's always something, not always easy to define, that isn't quite right. They pull out the vintage instruments, study the song writing styles, and do their best to replicate the sound in the form of new songs, but somehow you can always tell, no matter how good it is, that it's not an original. What's missing? Who knows. That certain mindset of a young musician living in the 60's; the zeitgeist; the drugs? Perhaps it's just that certain naivety, and the joy of discovering a new sound. Whatever it is, when you do hear the real deal, you know you're listening to it. Rust is the real deal. Originally recorded in 1969, their album, Come With Me, is something of a lost mini-classic. Kudos to Akarma records for finding this obscure album, originally released on the independent German label Hor Zu, and bringing it to light in the early 21st century. Great, psychedelic rock tunes are embellished with phased vocals, treated piano, samples of radio broadcasts, washes of organ, and electronic effects. Mind you, this isn't total freak out music, or anything. Songs like You Thought You Had It Made and Rust revel in blues licks, and rock with a genuine joy, even if the subject matter of their lyrics is somewhat pessimistic, and softer tunes like Please Return and the gorgeous Find a Hideaway are full of acoustic guitars and vocal harmonies. For a reference point, listening to it I hear a lot of The Deviants, with touches of the 13th Floor Elevators. It's melodic rock that likes to experiment. The CD is even packaged in a miniature gatefold LP sleeve that has the same texture and feel as one of those albums of the old days. Come With Me is a genuine pleasure all the way through. For more information you can visit the Akarma Records web site at: http://www.akarmarecords.com.